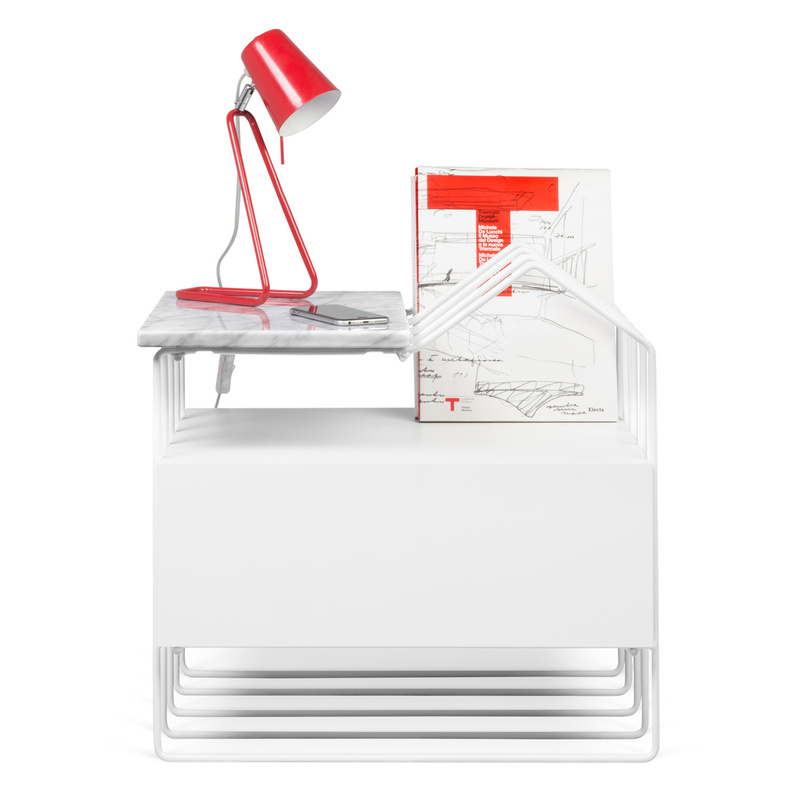 An innovative design for the Domi nightstand, combining different materials and shapes. 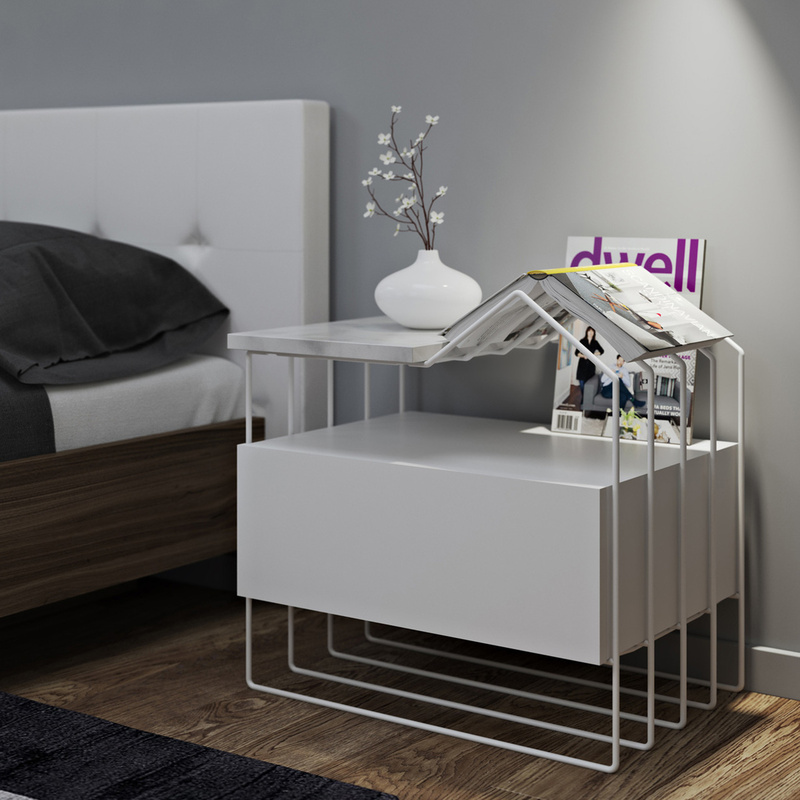 Created with contemporary and trendy lines, the Domi nightstand by Temahome features a state-of-the-art design that will add a touch of class and originality to your home. 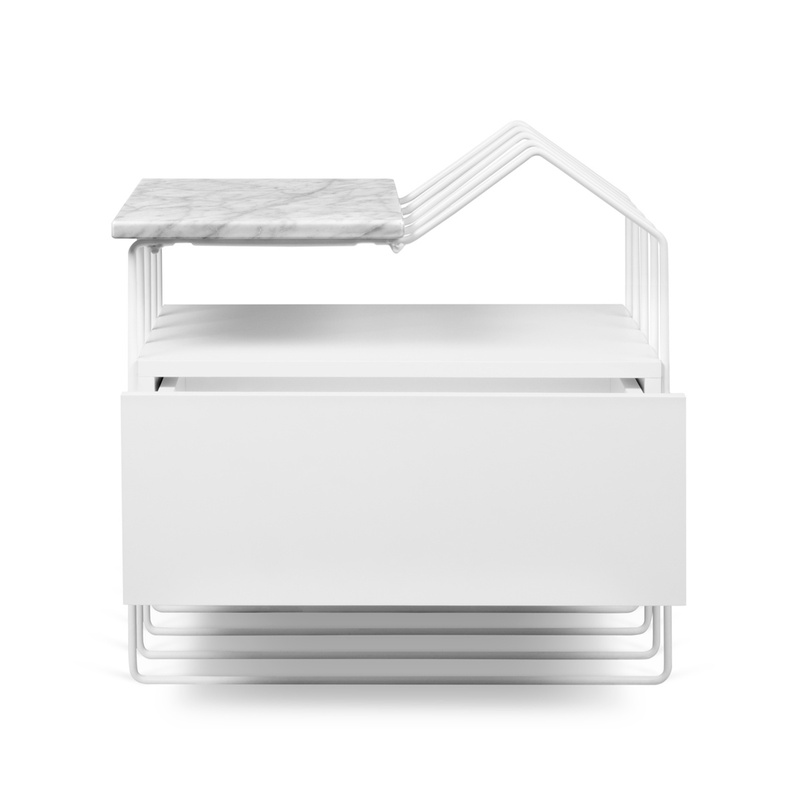 This bedside table uses different materials combined together to create a truly sophisticated decorative object: the wooden structure is supported by thin but strong lacquered pipe-like legs that start from the ground and run all along the cabinet, creating a wrap-around and glamorous effect while the supporting surface is made in luxurious Carrara marble, adding character to the piece, and features a metal triangle recalling the roof of a cottage that can act as a bookmark allowing you to place your book on it during a break from reading, a last touch of originality for a cutting edge design item. 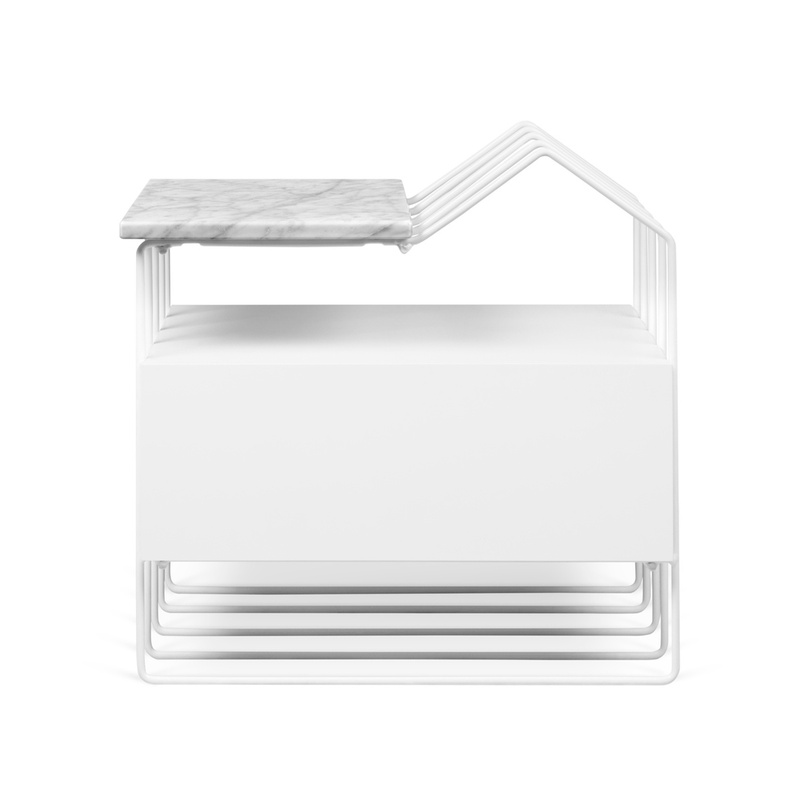 This beautiful piece of furniture is the right element to decorate any room with good taste and sophistication. 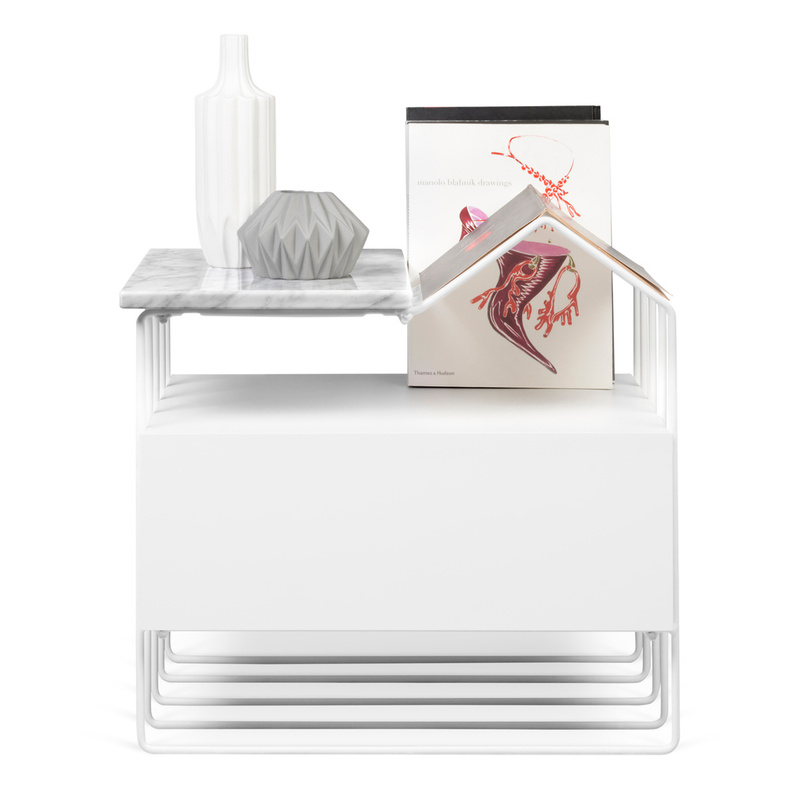 Used as a simple cabinet in the living room, Domi will add a touch of elegance thanks to its special white lacquer, ethereal and impalpable, yet its glossy finish fits well with contemporary-style furniture as well, white to create a bright environment or dark for an intriguing chromatic contrast. 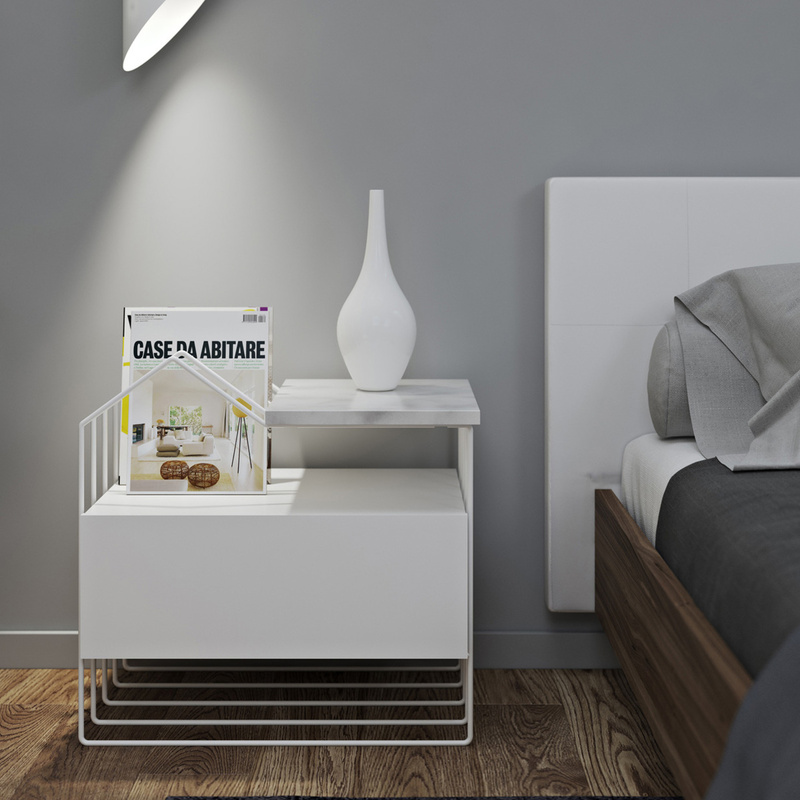 Perfect in the bedroom, the Domi nightstand will become the protagonist of rooms dedicated to rest and relaxation thanks to its shiny, ivory-coloured structure that makes it particularly graceful and pleasant to the eye. 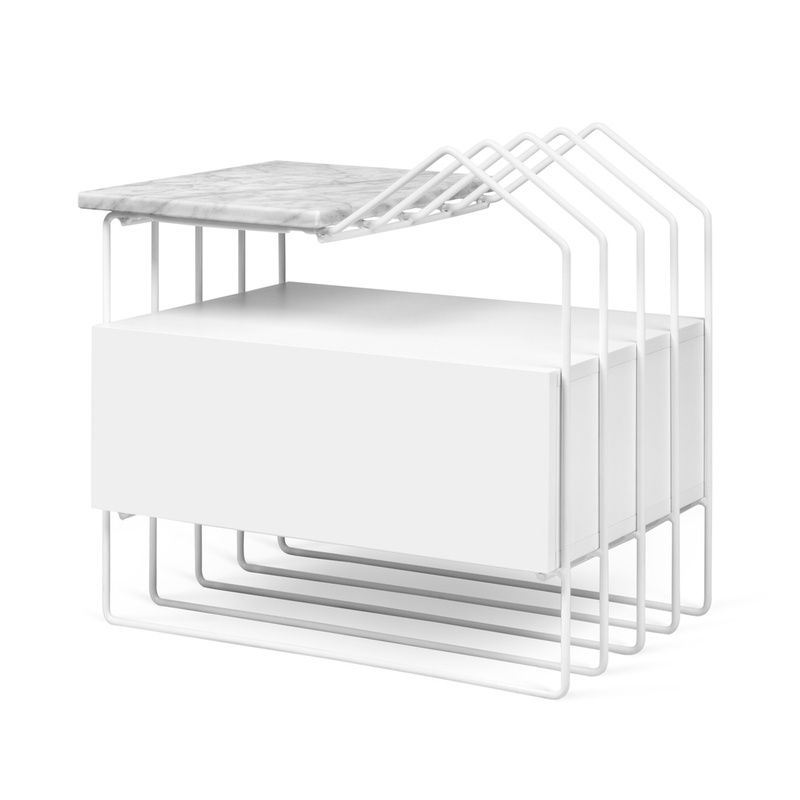 Rectangular in shape and very capacious, Domi is equipped with a convenient drawer to store personal belongings or any kind of object, safely and easily. Information: equipped with a drawer. 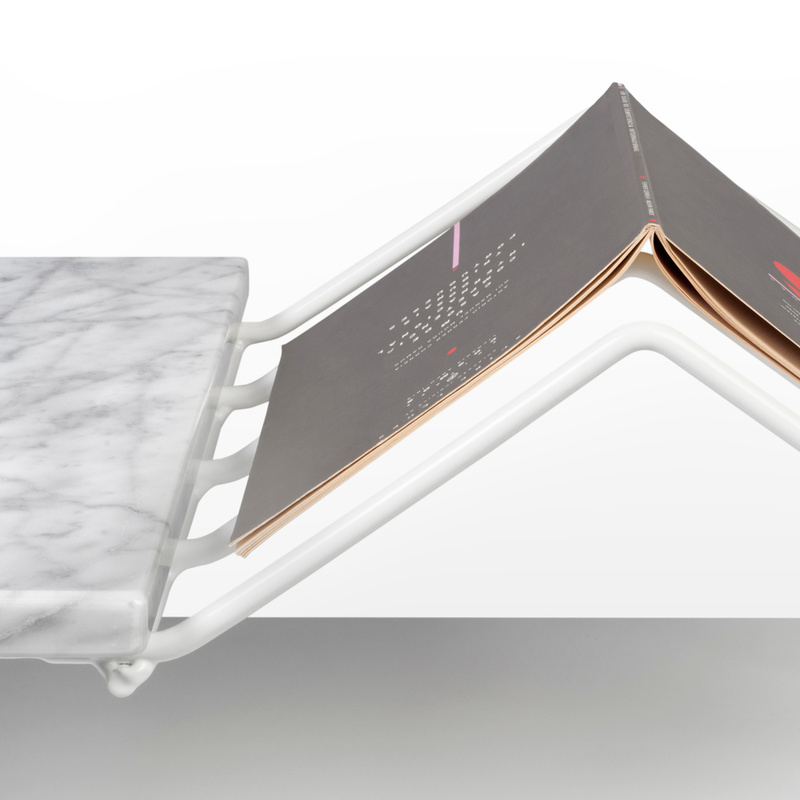 The marble shelf is placed at a height of 48 cm. Clean with a dry or slightly damp cloth. 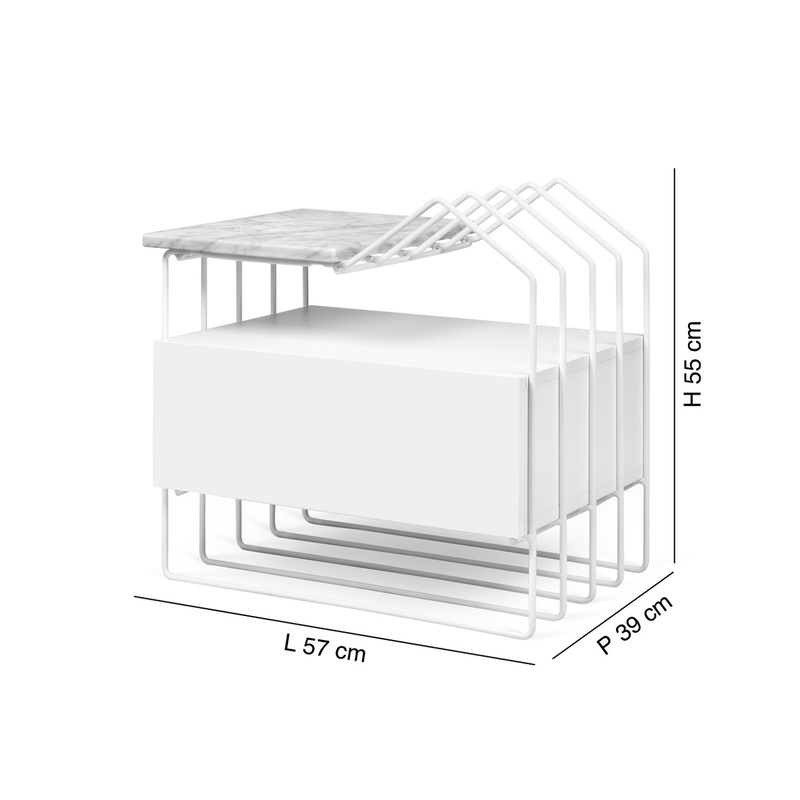 INFORMATION: It is possible to dispose the “little house” on the right or on the left side of the bedside table. Nádia Soares was born in 1986. She graduated from Faculdade de Belas Artes da Universidade de Lisboa with a degree in Product Design. 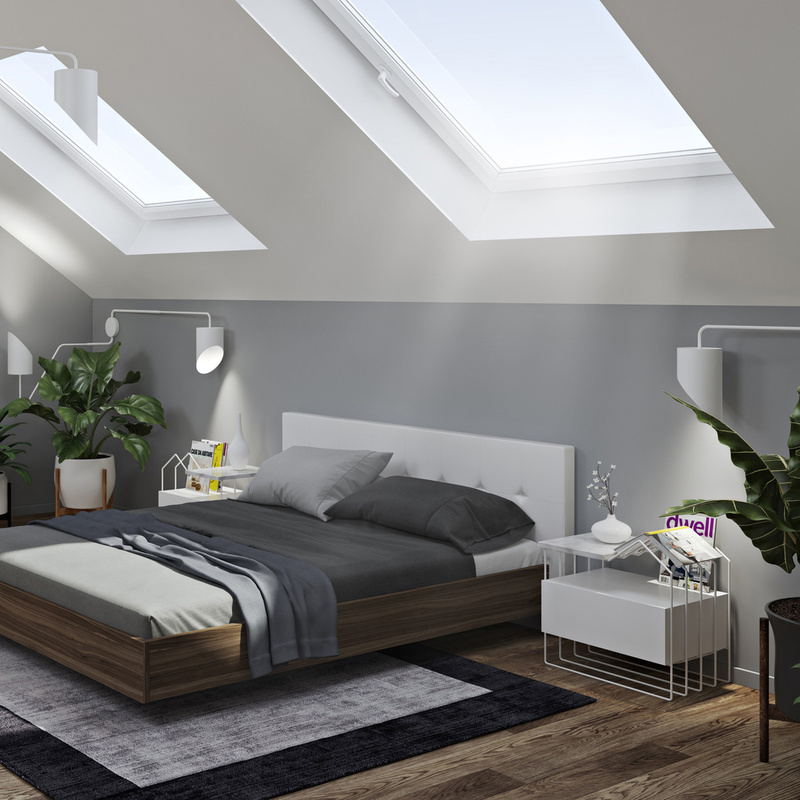 After winning a design competition organized by the Centro Português de Design, entitled Living Your Dreams, she is awarded an internship at Temahome. Her innate qualities as a designer quickly transpire into her work and she soon becomes a full-time member of Temahome’s workforce, where she currently holds the position of design and product development coordinator. It is her responsibility not just to follow, but to foresee new, emerging trends all around the globe as well, and to translate them into Temahome’s unique and original creations. Her team is always in touch with the production line and has a close relationship with the prototype department, where new ideas and experimental concepts are brought to life.Born in Lisbon in 1988, Mariana Carreiras has a master degree in product design (2013) from Faculdade de Belas Artes de Lisboa, following a bachelor degree in equipment design (2009) from the same university. Her professional career begins in 2011 with the coordination of both the store and gallery of Fabrica Features Lisbon, where she remained until 2013. In 2013 she takes part in the contest “Jovens Criadores”, being selected for the category of industrial design for her OLLA collection, an original ceramic tableware set. As a winner in this competition, she has the opportunity of undertaking an internship at Vista Alegre, the most important Portuguese ceramic brand, as part of the program ID POLL. 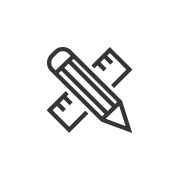 She then joins Temahome, where she is developing her unique personal touch in a number of different and challenging projects.